Amazing how a deadline focuses the mind, eh Sammy? Got through the last few slats this evening, planed them to thickness and then gauged a line and planed them to width. 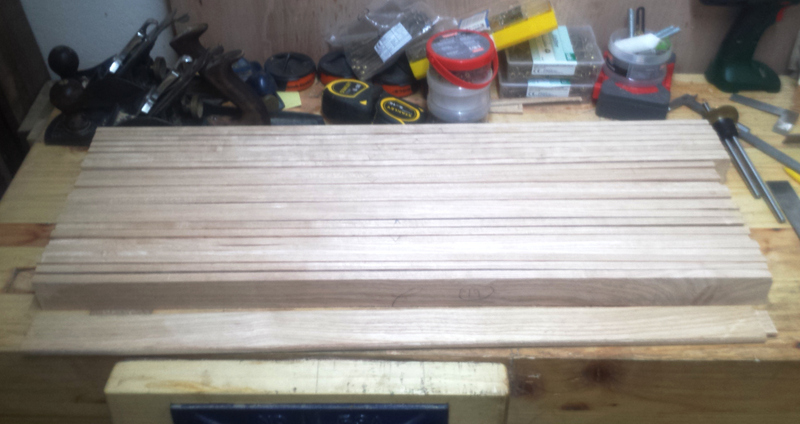 So now I have 18 30″ long slats and 8 31″ long slats (the extra inch is just how the board came out in the rough cut, I’ll trim them all to length when fitting them). And I spent a little while last night going over cutlist plans for the frame – I want to try using Sketchup to block out the design a bit more formally, it helped quite a bit with the bench. But the next few tasks are to get more frame stock cut and planed and sized. The panels around the drawer and the drawer itself should be relatively fast compared to the slats (I hope) and the drawer base faster still as it’s repurposed T&G stock so it’ll just be cutting the boards to length, planing away the existing T&G, rethicknessing it and then recutting a new T&G (I won’t glue up the base so that the wood can move more readily, the drawer will keep it corralled). And then this weekend, building the steaming jig and if the 2″ wide strapping arrives, I might even try using the jig (if it doesn’t, I’ll wait till next weekend and spend the time on other jobs).